this is a direct result of the Topic Summarization method. Understanding of the context gives rise to a better summary of the poem. Quality wise: By understanding intra document links and understanding the proper sense of the words the quality of poem lines selected is improved. Quantity wise: Again by understanding the context the algorithm is able to retrieve more relevant lines than simple term frequency. By using inter line links to reinforce the input message’s theme the remixed poem is of better standards. No stone is left unturned unlike the previous solution where only the top 3 synonyms were used to find the relevant lines. Apart from the above the work done by my fellow FYP student Sebestian incorporates Machine Learning and improves the system over time. All these are a direct consequence of the technical novelties in the components used for the system which are mentioned as follows. 2) Innovative & efficient approach to topic modeling which is quite different from the normal probabilistic models that is prevalent nowadays. 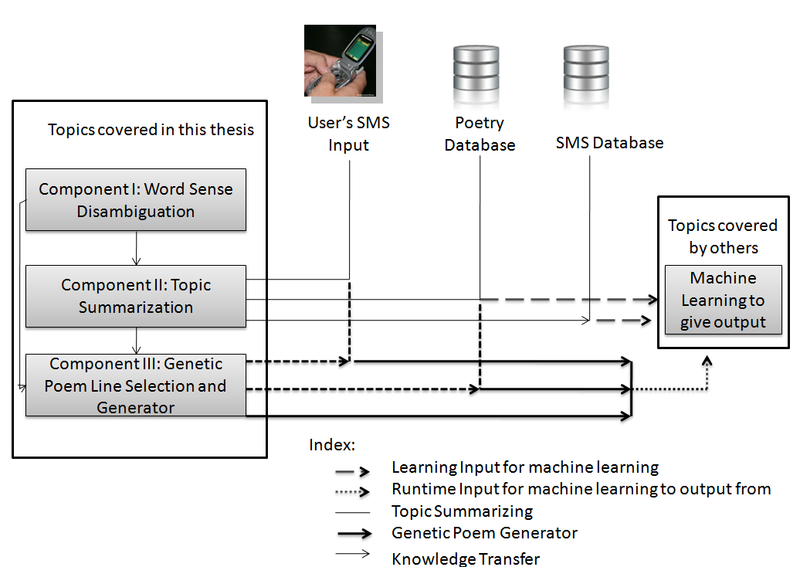 Some methods of word sense disambiguation in fact use topic modeling in their process. But a highly efficient word sense disambiguation tool has helped us build a good topic modeling system. 3) Innovative poem line selection algorithms that use recombination programs. Clearly there seems to be a bit more coherence & meaning in the poem generated by the new poem remixing system. You can clearly see more intra and inter relations. Details on CA 3 and 4 are in separate pages..